PatientSource's Investigations module allows clinical staff to book radiology and pathology tests. Lab and radiology staff can perform the tests and report the results. Clinical staff can view the results in real time. Pre-loaded with all known biochemistry, haematology, transfusion, xray, CT, MRI, ultrasound, fluroscopy and histology tests. Tests and order sets customisable by clients. PatientSource's electronic investigations module seamlessly stitches together all of your lab and radiology side systems to provide one central place where clinicians can requests investigations and view results, and technicians / reporters can process requests and issue reports. 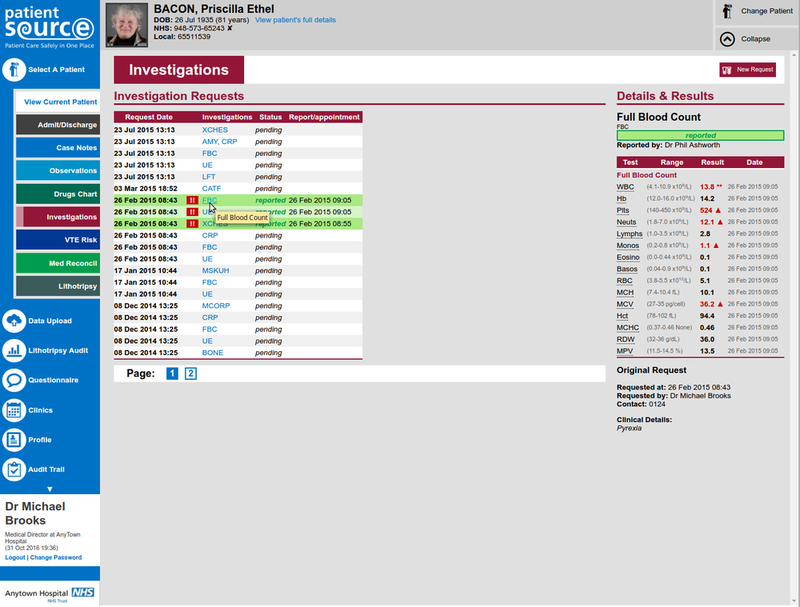 Our investigations module provides full Computerised Physician Order Entry (CPOE) for pathology and radiology tests. Clinicans can review results as a table of data, and even view individual results trends on a graph. There is a built-in radiology viewer that allows fetching images from radiology systems such as PACS, without requiring any additional logins or installation. PatientSource comes preloaded with all coded radiology and pathology tests, with common normal values applied where appropriate. The selection of tests you allow and normal values can be easily modified via the admin interface. Our Investigations module can work with all major Laboratory Information Management Systems (LIMS), Radiology Information Systems (RIS), and Picture Archiving and Communication Systems (PACS), so reporting staff can keep using their existing backend systems should they wish to. Our Electronic Investigations CPOE solution is one module of our modular platform, meaning it can be purchased as a stand-alone solution or as part of a wider PatientSource system. Customisable list of available tests, including customisable "order sets"
Pricing depends on the size of your healthcare organisation. We are happy to negotiate performance outcomes based payment. We are also happy to help you write bids for schemes such as the Nursing Technology Fund, to pay for your PatientSource electronic investigations solution.